The QGraphicsLineItem class provides a line item that you can add to a QGraphicsScene. To set the item's line, pass a QLineF to QGraphicsLineItem's constructor, or call the setLine() function. The line() function returns the current line. By default the line is black with a width of 0, but you can change this by calling setPen(). QGraphicsLineItem uses the line and the pen width to provide a reasonable implementation of boundingRect(), shape(), and contains(). The paint() function draws the line using the item's associated pen. See also QGraphicsPathItem, QGraphicsRectItem, QGraphicsEllipseItem, QGraphicsTextItem, QGraphicsPolygonItem, QGraphicsPixmapItem, and The Graphics View Framework. Constructs a QGraphicsLineItem. parent is passed to QGraphicsItem's constructor. Constructs a QGraphicsLineItem, using line as the default line. parent is passed to QGraphicsItem's constructor. 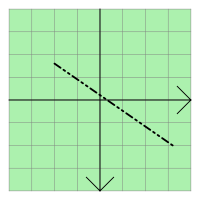 Constructs a QGraphicsLineItem, using the line between (x1, y1) and (x2, y2) as the default line. parent is passed to QGraphicsItem's constructor. Returns the item's line, or a null line if no line has been set. Returns the item's pen, or a black solid 0-width pen if no pen has been set. Sets the item's line to be the given line. Sets the item's line to be the line between (x1, y1) and (x2, y2). This is the same as calling setLine(QLineF(x1, y1, x2, y2)). Sets the item's pen to pen. If no pen is set, the line will be painted using a black solid 0-width pen.